The Home Health ICD-10-CM Coding Companion, 2019 is the perfect tool to use along with the Complete Home Health ICD-10-CM Diagnosis Coding Manual, 2019. 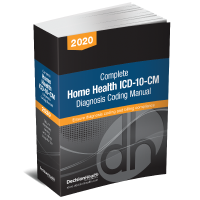 The Home Health ICD-10-CM Coding Companion, 2019 is the perfect tool to use along with the Complete Home Health ICD-10-CM Diagnosis Coding Manual, 2019. When purchased separately, you pay $418, but when you order these two products together, you pay only $319, a savings of nearly $100! 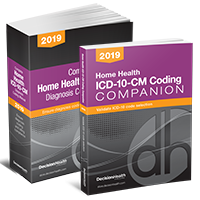 The Home Health ICD-10-CM Coding Companion, 2019 is the perfect educational resource to use in conjunction with your 2019 Complete Home Health ICD-10-CM Diagnosis Coding Manual. It's your guide to accurate coding and compliance with expert guidance and comprehensive decision trees to help you navigate the ICD-10 code set.